There has been growing scholarly interest in the role and function of non-state actors in global governance. A number of non-state governance schemes have been created in recent years to set environmental and social standards for the certification of private companies and producers. This Ph.D. project focused on certification schemes in the forestry and fisheries sectors, as initiatives in these two sectors arguably has represented the most advanced cases of non-state rulemaking and governance in the environmental realm. The following research questions were examined. (1) How can we explain the emergence and spread of non-state certification schemes in the forestry and fisheries sectors? (2) How and to what extent does the organization of standard-setting processes influence standard-setting outcomes? (3) What are the causal mechanisms that link certification schemes and behavioral change; and when, and under what conditions, are these mechanisms likely to influence behavior? In examining these questions, the project drew on institutional theory in political science and sociology – particularly regime literature and sociological institutionalist approaches to organizational behavior – as well as nascent research on global environmental governance. The empirical part of the Ph.D. project comprised comparative case-studies that examined the emergence and effectiveness of forest and fisheries certification schemes, with a particular focus on forest certification in Norway and Sweden. In addition, it was a multi-level study including the international level for both sectors. To assess the effectiveness of certification schemes, the project examined patterns of participation, the effects of third-party auditing, and changes in producer behavior following certification. In assessing broader consequences, the study looked beyond the instrument itself to a discussion of the changing relationships among business actors and environmental organizations, public and private regulatory interplay, and the reshaping of legitimate rulemaking authority in global environmental governance. This Ph.D. project was part of the FNI project New Principles and Instruments of Environmental Governance and the Influence of Scientific Input, which was financed by the RAMBU programme of the Research Council of Norway. 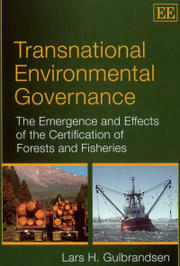 Transnational Environmental Governance: The Emergence and Effects of the Certification of Forests and Fisheries. Cheltenham, UK/Northampton (MA), USA, Edward Elgar, 2010/2012 (Hardback/Softback), 213 p.